Castel Sant'Angelo, also known as the Mausoleum of Hadrian, is a towering cylindrical building in Parco Adriano, Rome. It was initially commissioned by the Roman Emperor Hadrian as a mausoleum for himself and his family. The building was later used by the popes as a fortress and castle. The popes converted the structure into a castle, beginning in the 14th century; Pope Nicholas III connected the castle to St Peter's Basilica by a covered fortified corridor called the Passetto di Borgo. The fortress was the refuge of Pope Clement VII from the siege of Charles V of Spain during the Sack of Rome (1527), in which Benvenuto Cellini describes strolling the ramparts and shooting enemy soldiers. The Papal state also used Sant'Angelo as a prison; Giordano Bruno, for example, was imprisoned there for six years. Another prisoner was the sculptor and goldsmith Benvenuto Cellini. Executions were performed in the small inner courtyard. As a prison, it was also the setting for the third act of Giacomo Puccini's 1900 opera Tosca; the eponymous heroine leaps to her death from the Castel's ramparts. The Castle was once the tallest building in Rome. 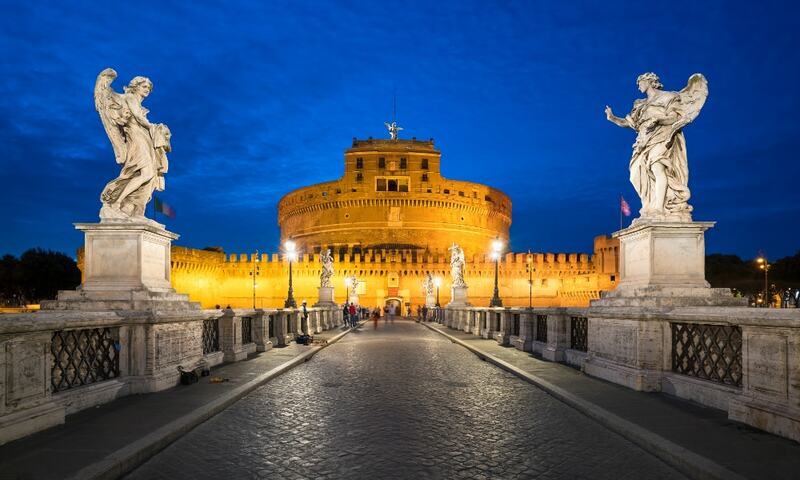 Decommissioned in 1901, the castle is now a museum, the "Museo Nazionale di Castel Sant'Angelo".